A concern with the hygienic properties of underwear developed during the last decades of the 19th Century. Animal fibres, and wool in particular, were championed by Dr Gustav Jaeger as the healthiest choice for the manufacture of undergarments. However, from the late 1880s these claims were challenged by the Cellular Clothing Company who believed that cellular cotton, an open weave fabric known by its brand name of Aertex, provided the optimum characteristics of insulation and absorbency. 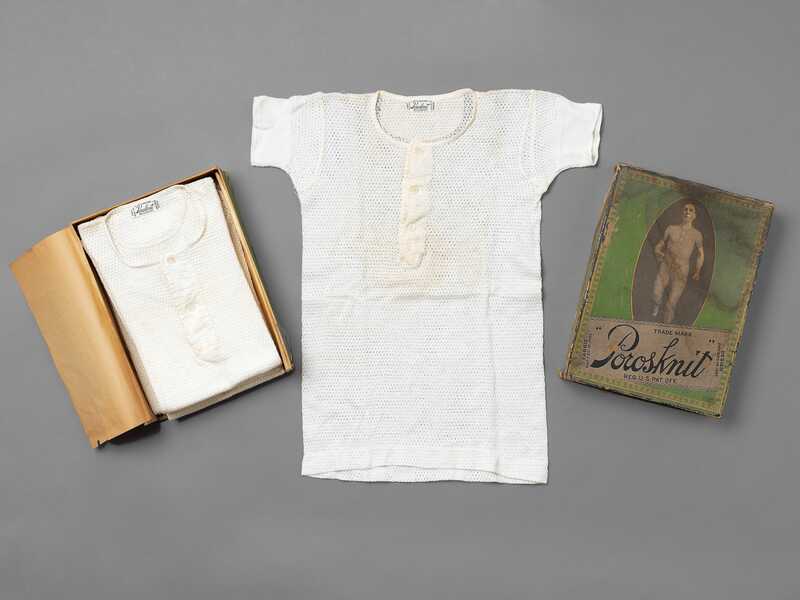 In the United States, the Chalmers Knitting Company of Amsterdam, New York, produced and promoted underwear made from cotton stockinette with small allover holes, which was patented in 1905 and named ‘Porosknit’, as porousness was considered a major healthgiving feature. It was described in a 1912 advertisement as ‘cool because of its ventilated texture. Cool because the soft fabric absorbs hot perspiration. Never loses its shape because it is cut like a coat. Fits faultlessly because properly proportioned. Yields to every movement because elastic’. Photographs of men partaking in energetic sports, in their Porosknit underwear, appeared on packaging and advertising, emphasising the brand’s suitability for a healthy lifestyle. 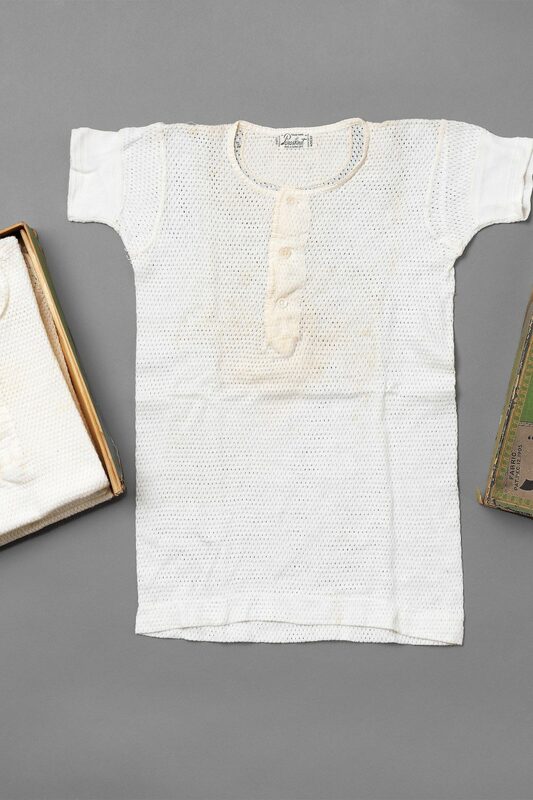 This box, with an image of a boy running on its top, contains five out of the original six unworn vests, size 26 inch chest, in a short-sleeved style suitable for summer wear. It was probably imported through ‘A. 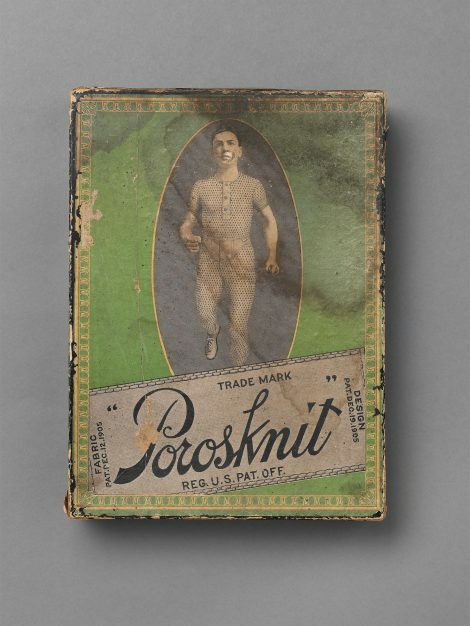 Merchant & Co.’ of East London, the sole supplier of Porosknit underclothes in the United Kingdom.